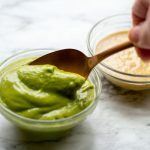 This easy Cilantro Dipping Sauce is the perfect accompaniment to spring rolls, fresh veggies, rice bowls and can be made in the blender. It's creamy, fresh and herb-y with just a kick of heat. Place all ingredients in blender. Blend adding enough water until smooth. Enjoy!